Introducing a revolution in pixel display elements! 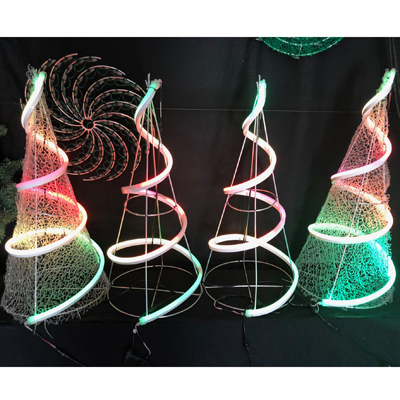 RGB Spiral trees - RGB Pixel display element perfect for any holiday display installation. 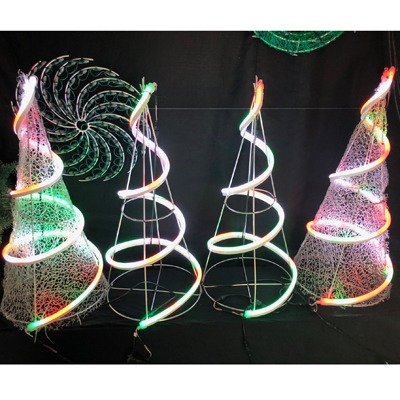 Our RGB Spiral Trees are perfect for adding RGB neon pixels for full colour lighting leaps and stunning lighting effects. With pixels, now you have complete control over every single pixel or the entire lighting element as is. Never before has a lighting effect been so visually entertaining on the eyes. 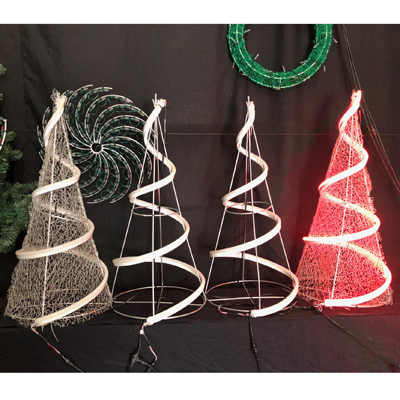 Made from aluminium, our lightweight RGB Spiral Trees are perfect for business or residential display. We are happy to be the first and only retailer of these items as they are made here in Australia. Ready 2 Run LightshowZ-All-In-One package. If none of our packages suit your needs, we can customize one that will Contact us! Step back and watch the magic, it doesn't get any easier than this! To purchase your Option please Choose from the dropdown menu below. Includes Lightshowz All-In-One Package plus 5 showz of your choice! Includes Lightshowz All-In-One Package with plus 5 showz of your choice! To purchase your Lightshowz Packages please Choose from the dropdown menu below. Whatever option you choose, it's all plug and play with our packages. No programming required! People will love your blinking Lightshowz! Ever imagined having your own holiday Lightshow: The Lightshowz All-In-One packages includes Music in synch with the lights, watch them dance to the music. You can output the music to speakers or use an FM Transmitter to broadcast the music to car radios! Running low on channels with your Lightshowz All-In-One : A single Lightshowz All-In-One package is capable of delivering its light show across several display elements depending on their size. If you reach the light limit on your first controller, not a problem! Depending on your requirements you can choose from our R2R Controllers that easily connect to your main controller to handle an unlimited number of props. For multiple Pixel controllers a network switch will be required. The pre-programmed light shows are stored on a show card which is inserted into the R2R Player, this can be updated at the customers request. You can find all our Singing Face, Arch and Mini Tree sequences here! We are able to do custom programming for large displays, if you have special requirements. Contact us for more information.